Why (Or Is) My Cat Fat? Obesity is a growing problem that currently affects the majority of U.S. cats. According to the Association for Pet Obesity Prevention’s 2015 survey, veterinarians consider an estimated 58 percent of cats to be overweight or obese. That makes excessive body weight the most common feline health problem — not just an abnormal weight issue. Our feline friends can become too heavy or too thin for a variety of reasons, ranging from poor-quality food to underlying health problems. Some mixed-breed cats may be more likely to gain weight than purebred cats, and some cats may have a naturally slower metabolism. Any medical condition that decreases a cat’s activity, such as arthritis, can lead to unwanted weight gain. And while there are other health issues that cause obesity in cats, such as an underactive thyroid (hypothyroidism), overactive adrenal glands (Cushing’s disease) or a tumor of the pancreas (insulinoma), they aren’t very common. So what’s the most common cause for tubby tabbies? A combination of too much food, too many treats and too little activity or playtime. How do you tell if your cat’s weight is normal? Figuring out your cat’s ideal weight can be challenging. 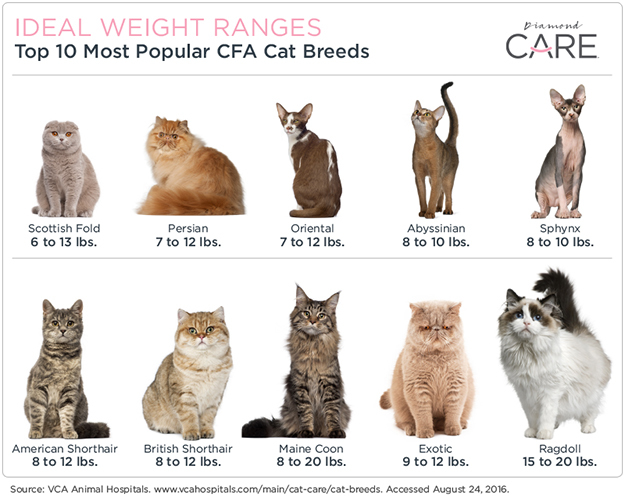 Although cat breeds have different ideal weight ranges, the number on the scale doesn’t really tell you if your cat is at an ideal weight for them. Is your fluffy feline fat or thin? Can you easily feel your cat’s ribs? Run your hands along your cat’s sides as if you’re petting it. If you can feel their ribs using only slight pressure, your cat is likely at an ideal weight. But if you need to apply pressure to feel the ribs, then your kitty is likely overweight or worse. Does your cat have an easily identifiable “waist”? When you look down from above your cat, do you see an hourglass shape with a waist between their abdomen and hip joints? Does their belly slope upward from the ribs to the back legs when you look from the side? Or does their belly apron (the skin of their tummy just in front of their back legs) swing when they trot or run? If your cat’s abdomen is wider than their shoulders or hips, chances are they are overweight. Is your kitty’s back flat? Do you feel matted or greasy fur or see dandruff down the middle of your cat’s lower back? Overweight or obese cats may look like they have a potbelly or even an egg shape when sitting. If your cat isn’t grooming their hips or lower back, they are most likely overweight. If you have a fat cat, you’re not alone. More importantly, you’ve taken an important first step toward addressing the problem — you’ve recognized it. Your next step is to schedule an appointment with your veterinarian, who can determine if there’s an underlying medical reason for your cat’s extra weight and create an appropriate weight management program to help your kitty achieve their ideal weight and body condition. Members of the veterinary healthcare team can provide support and encouragement along your cat’s weight loss journey. Your veterinarian may recommend feeding a specifically formulated cat food to help your kitty lose weight safely and slowly. That’s because weight management diets are designed to provide all of the nutrients a cat needs while reducing the number of calories eaten. Diamond CARE Weight Management Formula for Adult Cats is one food that can help address your feline friend’s weight issues. You can learn more about this new cat food by visiting the product information page.